Interest rates are going up so let’s address it now: this is unequivocally good news. This rise isn’t just starting — it’s been going on for almost two years. The overnight rate has been raised by the Federal Reserve six times since December, 2015, and now stands at 1.75%. The 10-year U.S. Treasury note touched its low point on July 8, 2016 at 1.36% and recently crossed 3.0%, a level not seen since 2013. 3.0% may seem high, but let’s bring some perspective. Going back to 1962, the average yield on a 10-year U.S. Treasury Note was 6.2%. Even if we limit our history to exclude the early ‘80s — when the 10-year rate briefly touched 15.0% — going back thirty years to 1988 shows an average rate of 4.8%. Though rates have been moving upwards for nearly two years, we are still well below historical averages. Higher rates are a hardship for some. Home buyers won’t like them, and it may slow down transactions, but not by much. Finding available inventory has become a bigger problem than obtaining the financing. Higher rates will limit the financial flexibility corporations have enjoyed for years by limiting their ability to take on more debt to fund excess dividend payouts of stock buybacks. And the U.S. Treasury will see a greater part of the Federal budget consumed by interest payments on the national debt. However higher rates have positive effects elsewhere. Higher rates will allow savers to earn more. They’ll reduce the worry about diminishing coupon returns covering their fixed costs. Higher yields will also allow capital to be allocated more efficiently, without the invisible hand of the FOMC pushing in any direction. For example, investors can reduce their allocations to higher yielding asset classes they wouldn’t normally own because of the higher risk profiles, but were effectively forced to buy in search of acceptable returns. Higher rates will also help fixed income return to its traditional role as the ballast of an overall investment allocation that best meets the risk parameters of each investor and contributes meaningfully to overall returns. The trick is getting there intact. For many fixed income investors, progressively lower rates were all they knew. Entire careers have been made of the idea of buying long bonds, clipping coupons and watching those bonds appreciate in value. That era is over. 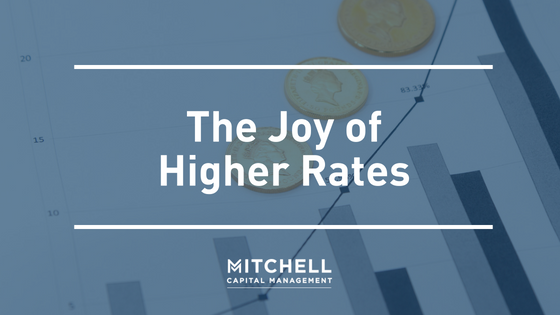 For some it can be difficult to see that historically low unemployment rates, a steadily progressing national economy, and inflation moving past 2% means higher rates for all maturities. Moving real interest rates positive and back towards ‘normal,’ or average, was never going to be easy, especially after having gone down so far. But the process has been underway for two years, we are managing it with intention, and it will be beneficial for fixed income investors in the long run. Let us know if you want to talk. Please click here to view our disclosures.